Phew! We are having a much more difficult time overcoming jet lag after returning home than we did when traveling the opposite direction – from home to Europe. Our plane to Europe left around 10:00 PM on a Friday night, and arrived at 11:30 AM local time on Saturday in Paris two weeks ago. After a few hours of sleep on the plane, we stayed awake for the day and went to bed around our usual time that evening. After that, we were generally pretty much easily readjusted to the new local time. Coming home was an epic event which involved getting up at 2:50 AM on Italy time (which would have been 8:50 PM the day before in our home time zone! ), an insane cab ride in to the airport in Rome (we’re talking 90 mph+ on the crazy freeways), waiting around the airport, 2 hours of flying from Italy to France, 4-5 hour layover, a nearly 9 hour flight back to Michigan, and a 30 minute cab ride home, which put us home at about 6:30 PM, local time (which felt like 12:30 AM to our bodies). I was more than ready for bed by 9:30 PM last night. But by about 6:00 AM this morning I was wide awake, and crawled out of bed at about 6:30 AM. Unheard of on a Saturday! The long and tedious hours of travel were only exacerbated by the head cold that I picked up during our last few days in Italy. All you have is time to sit and think about it! Luckily, I was entering the recovery stages on our day of travel home, but this was the day that the huz started developing his cold symptoms. Poor guy. The dry, recycled airplane air, changing pressures, and ear popping certainly didn’t help matters. Needless to say, these two tired, snuffly, jet-lagged souls, the huz and I, were in need of a comforting home-cooked meal today. 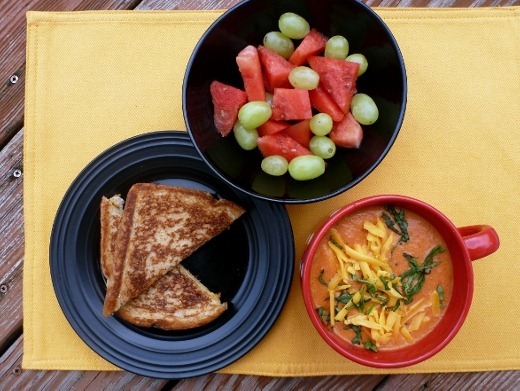 The huz requested grilled cheese and tomato soup. After an early morning grocery shopping trip, I came home and made an early 10:30 AM lunch for us. 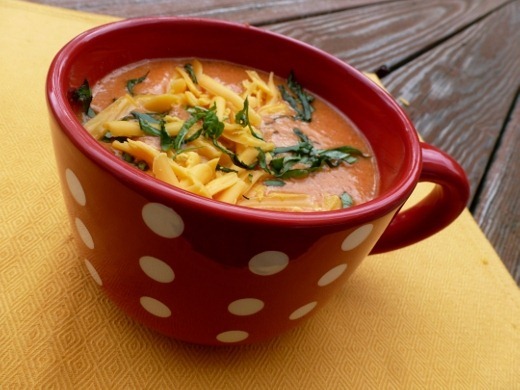 I made the meal a little more special by preparing homemade tomato soup instead of serving the canned kind. Using a recipe from More Fruit Please that I found on Pinterest and have been eyeballing for some time now, I quickly threw together this delicious, rich soup this morning. Since I used diced canned tomatoes that were pre-seasoned, I omitted the oregano, salt, and pepper called for by the recipe. 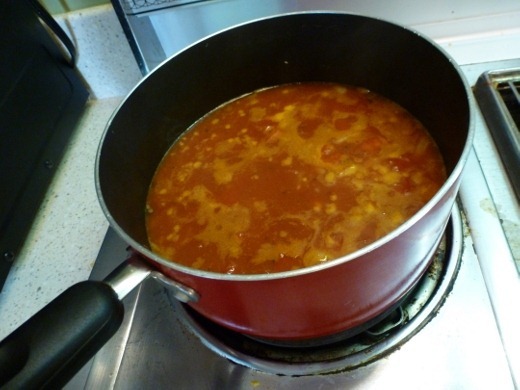 First I sautéed onion and garlic in olive oil, and then added vegetable stock and undrained, canned diced tomatoes, pre-seasoned with Italian seasonings, and let this mixture simmer, covered, for about 10 minutes. 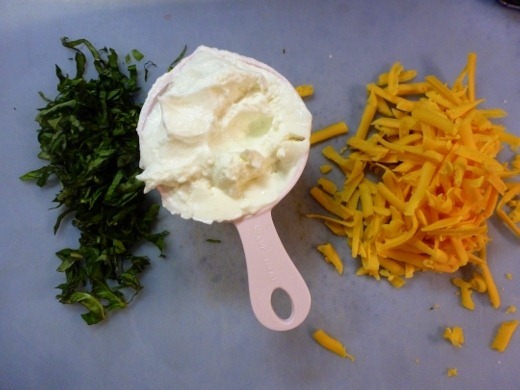 Then I removed the pan from the heat, and stirred in fresh basil, Greek yogurt, and sharp cheddar cheese. 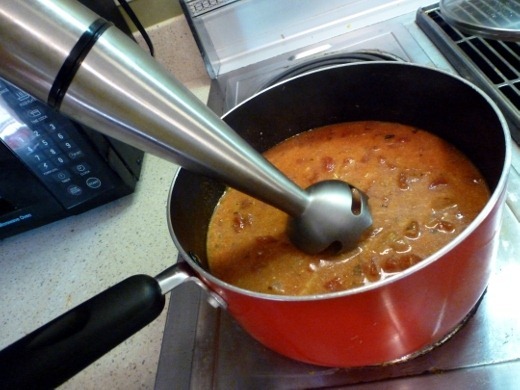 Then it was time for one of my most-fun kitchen tools: my immersion blender! On the side we had a traditional grilled cheese (Kraft singles, baby! ), and nutrient-rich fruit for our recovering bodies! 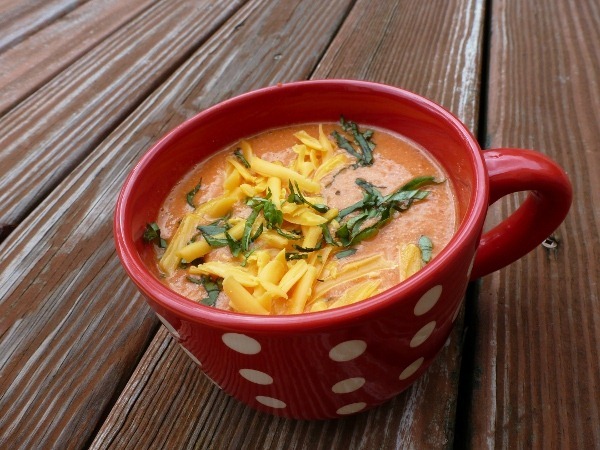 This Tomato, Basil, & Cheddar Soup was awesome! The texture was thick and rich, and oh-so-comforting. Yup, the soup was just as tasty as it looks. A keeper! With all that said, I really have absolutely nothing to complain about, with regards to my mild head cold and jet lag. After spending two amazing weeks in Europe, every second of snuffliness and jet lag is completely worth it. I feel so grateful we were able to go on this trip! More coming soon on that! Another thing I have been completely savoring today: COFFEE! I avoided coffee during our trip, since it seemed that bathrooms were so few and far between during our travels, I didn’t want to drink something that would only send me in search of them more frequently. But boy oh boy, how I have CRAVED the stuff the past two weeks! 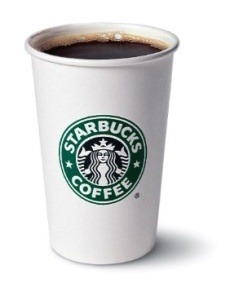 I downed a giant 24 ouncer from Sbux this morning and it was nearly euphoria-inducing, I tell ya. Coffee. Yeah, that’s the stuff. Pingback: Memorial Day 2013 | Meg.Goes.Nom.Nom.